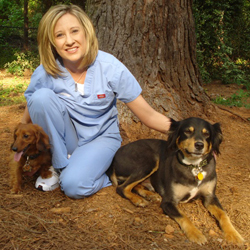 Dr. Summer Shivers is a Kansas native who joined Brawley Animal Hospital in 2007. Dr. Shivers attended Kansas State University for her undergraduate studies and received a BS in Animal Science. She continued on at Kansas State University College of Veterinary Medicine and graduated in 2006. In her free time, Dr. Shivers enjoys working out, spending time with her human and animal family and cheering on her K-State Wildcats. In February 2010, Dr. Shivers along with Dr. Finkes became the proud practice owners and have been kept extremely busy with the day-to-day running of the Brawley Animal Hospital.